GoldieBlox is brilliant. 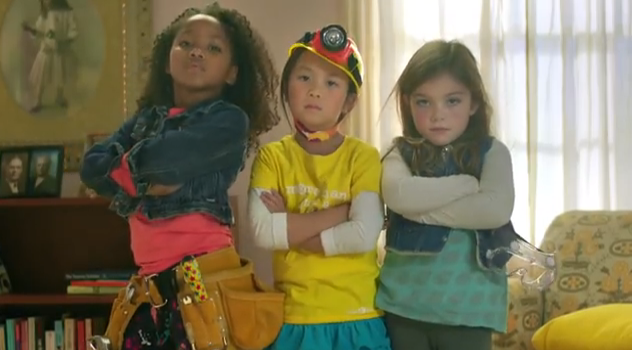 The company, which makes construction toys specifically for little girls in an aim to excite them about engineering, recently released a delightful, exuberant ad which has gone massively viral and might get them into the Super Bowl. The ad depicts three fierce, intrepid little girls setting off an elaborate Rube Goldberg machine made out of their girly-girl fare against a defiant rewrite of “Girls” by the Beastie Boys. The Beasties and their various labels and publishers, including Island Def Jam and divisions of Universal & Sony, sent GoldieBlox a letter which, according to GoldieBlox, threatened action for copyright infringement — so GoldieBlox sued first. Boom! The internet exploded again. GoldieBlox, as it turns out, is not only brilliant at making and marketing toys. It’s also pretty brilliant at offensive PR. Boom! The Beastie Boys fought back today with an open letter to GoldieBlox, stating that, while they were all for empowering women, “long ago, we made a conscious decision not to permit our music and/or name to be used in product ads.” They topped off their response with deft twist of the knife, noting that all they’d done was send a letter — “YOU sued US.” The Beastie Boys know from brilliant PR themselves, thanks. What is at issue here, however, is which one is brilliant at fundamental legal reasoning. The Beasties claim the song is theirs to license as they see fit, for good or, er, ill. (Sorry.) Goldiblox argues that they have a right to use “Girls” under the doctrine of Fair Use. Who’s right? No one knows! “Fair Use” is not what’s known as black-letter law, i.e., well-established, settled and clear-cut, with criteria that establishes whether you did or you didn’t, are or you aren’t. Think of violating a curfew. Were you out past 12 am or not? You may have had a good reason for violating the curfew — I swear, Mom, we lost track of time! — but the trigger is clear and precise. Fair Use is more like murky, blurry, I’ll-make-my-best-guess law. It is governed by four factors, each evaluated in conjunction with each other, and is decided on a case-by-case basis. That decision is made by a court at the behest of one of the parties. This is why we don’t know whether GoldiBlox’s use of “Girls” is fair use — it hasn’t been decided yet. But we can make a Fair Use argument — and that is what I have laid out below. That’s it. This is an evaluation meant to specifically balance the individual right of the copyright holder against our collective interest in progress as a society. Notice that nowhere does the statute invoke the will of the original creator — like the honey badger, the statute don’t care. The rights accorded by copyright are not absolute. Which is why the will of the Beastie Boys in their letter above is irrelevant here — even Adam Yauch. Yauch, who died in 2012, put a clause in his will prohibiting the use of his music for any “advertising purposes” after his death. That, however, only affects how his estate is authorized to license his work, which is a function of granting permission. In the case of a Fair Use claim, it is the Court which grants permission. Okay. Let’s break it down. (1) Purpose/character of the use — Goldieblox has argued that the use was criticism and social commentary, both on the original sexist lyrics and on the state of girls toys today. True on both counts! This is a strong argument for them thanks to their strong social good mission. They will also argue that their use was transformative — i.e. that their own creative contribution to the work turned it into something distinct and singular. On page 6 of its complaint, GoldieBlox compares the original, sexist lyrics to “Girls” with the empowering, feminist version in their work (“Girls — to do the dishes, Girls — to clean up my room” vs. “Girls — to build a spaceship, Girls — to code the new app”). The point of parody is to transform — to use the meta-understanding of the source to deepen the meaning of the new work through contrast. In this way parody is almost always fair use, from Weird Al to 2 Live Crew (a case which held that their commercial parody was fair use despite being commercial). This is the strongest argument that GoldieBlox has. But — the use is commercial. This is the strongest argument that the Beastie Boys have. Sure, GoldieBlox is pushing back on sexism, but the Beasties will argue that it’s just an excuse to use an unlicensed version of their song to sell their wares. That is usually expensive. If everyone could get around licensing fees by changing the words then Pringles could do a whole ad campaign for all the Pringle Ladies without paying Beyonce. All the Pringle ladies! All the Pringle ladies! Put your chips up! Actually, that would be a great ad. But it would be one that Pringles should have to pay for. This is will be the most decisive point here. Is GoldieBlox’s song a transformative piece of social commentary or a cheap toy ploy? I come down for GoldieBlox here, as the Court did for 2 Live Crew in ‘94. That said, fair use is decided on a case-by-case basis on all four factors so, onward. The Beasties will say “They ripped off our song!” and this is where that argument is the strongest. Point, Beasties. (3) The amount of the copyrighted work used — Goldieblox is weak here, since they used the whole thing (including the characteristic pause in the middle and the double-time “Girls” riff at the end — over which the eponymous Goldieblox character appears.) I disagree with the EEF’s McSherry here, who thinks that since the GoldieBlox song was shorter it counts as only using a part of the song. If you listen to the two side by side it’s clear that GoldieBlox’s tune is mapped out against the full arc of the original “Girls” — which actually is a point in favor of establishing parody, since good parody is a function of the details. This point is far more compelling in cases of artists who use only a part of a song and then build on it. Like, say, the Beastie Boys. The Beasties will say, “You used the whole song!” And they will have a point. (4) Effect on the market — Here’s where GoldieBlox catches a break. Because, seriously, the Beastie Boys really think this is going to cut in on the massive demand for “Girls”? C’mon. If anything, this just reminded millions of people of the song “Girls” and probably a bunch went to download it. I bet if someone checked out iTunes there would be a spike. The Beastie Boys could say that having another unauthorized version out there will dilute the market, and maybe a generation of girls who would otherwise have liked “Girls” will now like another version of “Girls.” Maybe they could argue that if HBO’s “Girls “wanted to use “Girls” on “Girls” they might lose out on the licensing of “Girls” to the other “Girls.” Could happen. Upshot: GoldieBlox has the edge here, based on its strong parody of “Girls” and the strong case law supporting that expressive right. Even so, GoldieBlox has the decided PR edge — righteously proclaiming themselves on the side of progress, equality, and a nation of adorable little girls. This leaves the Beastie Boys as, sure, the artists who created the song — but also the artists who said that girls were for making their beds, doing their laundry, and satisfying their urges. Rachel Sklar is a former lawyer, and also a former little girl. She is the cofounder of TheLi.st and writes frequently on tech, media and culture. This is her favorite open letter from the Beastie Boys.